Detail of one of the custom produce display cases built by SPACEconstructors. Is your family looking for high-quality, locally-sourced, affordable food? Yeah? You need to visit our new neighbor, City Greens Market. 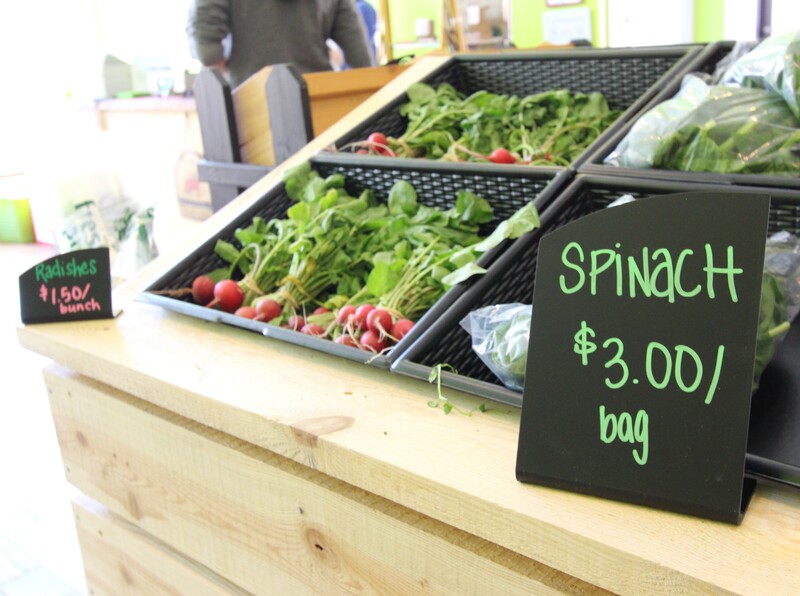 Traditional grocery stores can be expensive, and CSA shares may not give your family the flexibility you need, so City Greens is a great way to give your family healthy choices that won’t break the bank. Their grand opening is Thursday, May 1, 2014 from 11:00 am to 2 pm, and you can read more about the day’s festivities on their press release. In addition to seasonal produce, City Greens sells local meats, cheeses, dairy and pantry staples like pasta, rice, and peanut butter. Here’s a list of some of their vendors and wares. The best part? You get to buy it at or below cost. City Greens is non-profit, so their mission is to bring fresh, affordable food to the community. They operate on a membership basis: If your household income is less than $30,000, there is no membership charge. All other households have a yearly fee of $150, but you’ll easily make that back in just a couple of shopping trips. Here’s a link to their membership application. City Greens moved from their old home on Boyle to a more visible location at 4260 Manchester, just a block and a half west of our studio. (The windows are trimmed in bright green paint — you can’t miss them!) To lend a hand to a non-profit neighbor and to fulfill our commitment to the AIA’s 1% initiative, we helped design the new space, which was formerly No Coast skate shop. After selecting a cheerful color scheme of white, celery, and persimmon, we designed their new window film signage and an exterior sign, which we are fabricating in our shop now. SPACEconstructors built a country-style checkout station and produce display units that were designed to fit their existing produce trays. Don’t forget to come out to the grand opening this Thursday to give them a warm welcome to the neighborhood!